Digital Temperature Control System : Provides precise and constant temperature. This level of precision allows food products to remain fresh over an extended period of time. High-Tech Monitor : The monitor digitally displays the present temperature. You can easily change the temperature by adjusting the thermostat. Automatic Evaporator Fan Motor Delays : Through stopping the evaporator fan when the refrigerator door opens, the circulation of hot, moist air into the refrigerator is prevented. This increases energy efficiency and lengthens the life of the compressor. 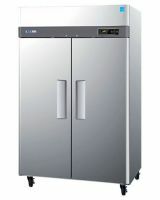 Stainless Steel Cabinet Construction : The Turbo Air M3 refrigerator model boasts a stainless steel exterior (galvanized steel top, bottom and back) and stainless steel interior with AL inside walls and door liners. It guarantees the utmost in cleanliness and long product life. Unlike other companies' products, the sharp corners and edges have been rounded to reduce the risk of injury. The M3 can add a touch of style to the most refined setting. Top Mount Compressor Units : The refrigeration systems are designed to ensure that each part is properly sized and balanced to achieve the highest efficiency and performance.